Like the above depiction of the Unisphere inside a ring of stars, the earth may be at a near the center of a concentric ring of galaxies. New evidence suggests the earth may be at the center of a huge structure in space. That contradicts the Big bang, so prepare for a new big bang fairy tale to explain it. New discoveries about the organization of the galaxies in space are challenging what big bang theorists have always believed about the the structure of the universe. The new evidence challenges the tenets of the popular but disputed big bang theory down to its core. Even though the big bang was first proposed by a belgian priest named Georges Lemaitre, it is essentially a secular theory stating only naturalistic causes are responsible for the creation of the universe. That being the case there are two essential assumptions key to the theory which are required to maintain the appearance of the creation of the universe being an entirely natural event. These two principles are necessary to prevent the conclusion of special creation particularly in light of Hubble’s discovery in 1929 that resulted in the law that bears his name. That discovery – based on observing the red shift of galaxies2 – is that all galaxies are moving away from us. And the further away the galaxy is, the faster it’s moving. This is true in whatever direction you look – everything is moving away from us, and the most distant ones are moving fastest. It doesn’t take a genius to figure that fact appears to put us at the center of the universe. Hubble, an atheist, abhorred that thought. Putting our planet at the center of the universe is not the expected outcome of a lifeless, careless explosion. That is more like something a loving God who wanted us to have a good vantage point would do. How to over come that and keep the appearance of a naturalistic process? 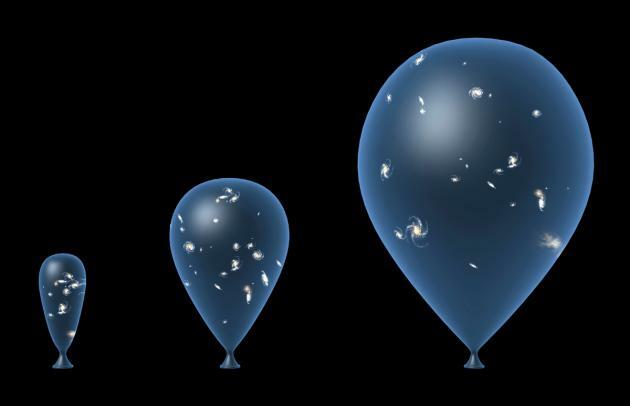 Typical depiction of expansion of the universe – as an expanding balloon. By assuming that the universe is both homogenous and isotropic. Then the expansion of space can be described with the common balloon illustration. Picture the universe as an expanding balloon (opposite). Like the galaxies visible on the surface – as the balloon grows larger everything on the surface moves away from each other – regardless of where you look, or where you are. But the latest discovery by scientists indicates that the universe is neither homogenous nor isotropic. 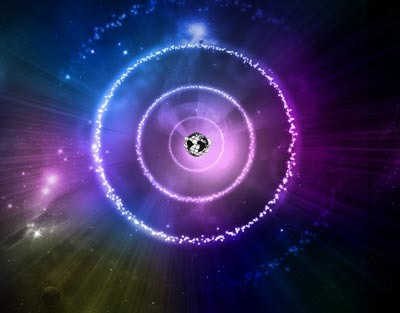 Instead of being the equivalent of an amorphous blob, scientists are discovering there is a distinct structure to the universe, and the earth appears to be in the center of it. “…researchers have announced the discovery of a truly monstrous structure consisting of a ring of galaxies around 5 billion light-years across. Further research is continuing on these fronts, but the initial evidence appears clear: space is arranged in a super structure of galaxies arranged in concentric circles, and our galaxy, the milky way is at or near the center of it. If this is true it totally blows the big bang and its complete reliance on natural processes out of the water, because that is clearly a designed structure. Natural explosions don’t create concentric rings of matter and put an observation platform conveniently in the middle. That is the work of a designer. And as even atheist scientists will admit, a designed structure requires a designer. I had originally intended to title this article “The Late Great Big Bang Theory”, because with this latest evidence the big bang has the final nails hammered into its coffin as the evidence for design is inescapable. But as I have written about previously, like evolution, the big bang, is not science; it is religion. And believers in this religion will not let it go easily. They will attempt to rise to this clear challenge. How have they risen to past challenges? I have documented previously the typical response: fairytales.6 When challenged with the impossibly even temperature of the cosmic microwave background radiation (CMB) of the universe and the horizon problem, a big bang scientist came up with an impossible solution – the idea of “cosmic inflation.” The rest of the big bang gang, – having no other solution – jumped on the band wagon. When faced with the problem of the extreme fine tuning of the universe (another impossibility for a randomly created universe), what did scientists come up with? The fairy tale of the multiverse – the theory there are an infinite number of universes, all with different values for laws of nature such as the gravitational constant and the electromagnetic force constant7 – and we just happened to wind up in a universe where they are all precisely set for life. When challenged with distant galaxies moving much faster than they should, and the universe expanding much faster than expected, what did they come up with? The hypothetical concepts of “dark matter” and “dark energy” respectively. In theory 96% of everything that exists in the universe is made out of dark matter, yet scientists can find no evidence of it.8 (The remaining 4% is regular matter – the stuff we’re made of and can see.) Nor do they have any evidence of dark energy. Given their history and propensity to make up stories to save their deeply ensconced theory, it is clear even this clear evidence will not be sufficient for them to admit the theory is simply wrong. If they can say with a straight face, and actually believe that the universe and everything in it exploded into existence out of nothing and formed itself, then this simple evidence of a clearly designed structure will not persuade them. So instead, let me make a prediction: Be prepared for another outrageous story to explain away the super structure of the universe that evidence is making increasingly clear. I don’t know what this new theory will be – whether “dark cosmic collisions of branes (cosmic membranes separated by a 4th dimension) that result in rings of matter like dropping pebbles in a pond” or perhaps “a dark mystery field that gives the missing anti-matter9 a property that forms them into a torus which them pulls matter around them into a naturally formed super structure.” Scientists have plenty of imagination – they’ll come up with something. I don’t know what it will be, but they’ll come up with something. They have to – they’ll need it to prop up the failed theory in the light of new conclusive evidence against it. And when it comes, I’ll update this article with the fairy tale they come up with. As guaranteed, cosmologists have a new fairy tale: invisible dark matter aliens. However there’s still one yet to come – about the location of the earth in universe as detailed above. 2 The assumptions of being homogeneous and isotropic are also required for the equations used to quantify aspects of the big bang such as the age of the universe. If those assumptions are not made, the equations are invalid. 3 Like an approaching siren sounds higher pitched and louder, and a receding one sounds lower pitched and softer, approaching galaxies have their light waves compressed together resulting in shorter wave lengths that we see as bluer or blue shifted, while receding galaxies have their wavelengths stretched out resulting in longer wavelengths that we see as redder – or red shifted. This entry was posted in Big Bang, Cosmos-the, Dark Matter, Evidence, Predictions by Creationist, Science, Science Fictions, The Cosmological Principal and tagged John Hartnett by Duane Caldwell. Bookmark the permalink.